Panleukopenia is a viral disease of cats often called feline distemper. It is highly contagious and can be fatal, especially in kittens. It is one of the diseases for which cats are routinely vaccinated (the "P" in combination FVRCP vaccines). Once a leading cause of death in kittens, panleukopenia has been mostly eradicated thanks to the vaccine, and it's not contagious to humans. But unvaccinated cats, such as stray or feral cats, are still at risk, especially kittens. Feline panleukopenia is a disease caused by a type of parvovirus very closely related to the parvovirus found in dogs. The virus can be spread by direct contact with infected cats but also indirectly by contact with items contaminated with the virus. The virus survives a long time in the environment and is resistant to many disinfectants, so virtually all cats will be exposed to this virus at some point. Lethargy and mood issues can be difficult to detect in cats, who typically spend much of their time snoozing, but if your cat isn't showing interest in toys it usually likes or seems to avoid contact with you, these can be signs of depression. The virus also causes a marked decrease in white blood cells, leaving affected cats susceptible to a secondary bacterial infection. Dehydration and secondary bacterial infections are often life-threatening in these instances. Panleukopenia damages the intestines, and like parvovirus in dogs, attacks the infected animal's bone marrow and lymph nodes. When pregnant cats are infected in early to mid-pregnancy, their kittens are usually stillborn. When infection occurs late in pregnancy, the kittens may survive but the virus may affect their brain development, causing the kittens to be born with a condition called cerebellar ataxia which damages the part of the brain that affects motor control. Kittens born with this condition often suffer tremors and other health issues if they survive at all. The diagnosis of panleukopenia is often based on history, symptoms, and physical exam. A blood count may reveal a decrease in all types of white blood cells (which is actually the definition of "panleukopenia"). Laboratory tests can be done to check for the presence of the virus as well. The cause of feline panleukopenia is feline parvovirus (FPV). Cats can develop FPV when they come into contact with blood, feces, urine, or other bodily fluids that are infected with FPV. The FPV virus can also be spread via humans who have been in contact with other cats that have FPV and didn't wash their hands or change clothes. Materials like bedding or food dishes that are shared between cats can also spread the virus. There is no cure for the panleukopenia, so treatment is aimed at managing the symptoms while the cat's immune system fights the virus. Hospitalization is usually required, and intravenous fluids are usually necessary to stave off dehydration. This can be costly, so be sure you're prepared to pay for several weeks of treatment, and that your cat has a good chance of survival. Antibiotics will not affect the virus, but your veterinarian may prescribe them to prevent or fight secondary bacterial infections, and medication to reduce vomiting may also be used. In severe cases, blood transfusions may be necessary. The infection usually takes five to seven days to run its course. Kittens under 5 months are usually the most severely affected, and even with intensive treatment, the outcome can be fatal. A cat with panleukopenia should be isolated from other kittens or susceptible cats. After the symptoms clear up, infected cats can still spread the virus for several weeks. If you have a multi-cat household discuss precautions to take, including disinfection, with your vet. Litterboxes should not be shared among infected cats or non-infected cats for several weeks after treatment, if ever. Vaccinations provide good protection against panleukopenia and are part of the core vaccines routinely given to cats. Your vet will recommend a series of vaccines (usually starting at 6 to 8 weeks of age), and it is important to follow this schedule as the vaccinations are not totally ​protective until the full series is given. Different types of vaccines are available, and your vet can help you choose the one right for your cat. Keeping kittens and cats indoors and away from other unvaccinated cats is the best way to prevent exposure to the virus. 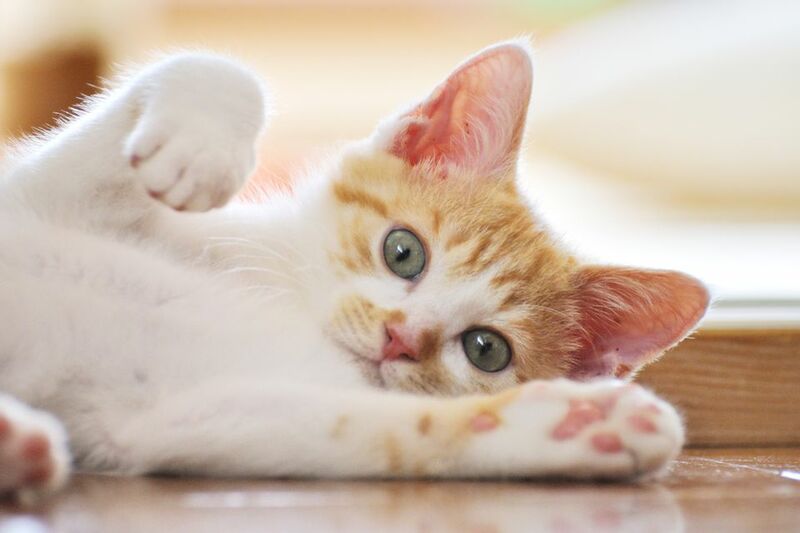 Since the virus survives for so long in the environment, if you have had a cat with panleukopenia, talk to your vet about precautions to take before introducing any new kittens or unvaccinated cats into your home. A diluted bleach solution to clean surfaces will kill the panleukopenia virus but cannot be used on all surfaces that might harbor the virus. Any soiled bedding and soft toys an infected cat may have used or played with should be discarded.